I'm really layed back about permissions. My only requirement is that you do NOT pass this off as a product you made. Any deck sheets made with this product is yours to do with as you wish, but if you redistribute said decksheet(s), it would be cool if you let people know you made it with Thundross. It is not a requirement to do so, but it would be awesome. Lastly, the json files and image files downloaded by and used in this product are not owned by me. They are supplied and used with permission by mtgjson.com and mtgimage.com. Please show the creator some love as he is an awesome guy! MAJOR: Easy Booster Pack Creation! MAJOR: Downloading cards no longer freezes program. MAJOR: Multiple cards download at the same time. MAJOR: You can now remove cards from your deck list with the delete key. MAJOR: You can now change the quantity of cards in your deck list with + and -. Minor: Typing Card names now waits a half second before filtering. READ ME FIRST: This tool is in VERY early alpha! It lacks polish, but all of the important functionality is there. If you find an issue with the program, please let me know in the comments and I will try to get it fixed ASAP! IF THE PROGRAM IS CRASHING, MAKE SURE YOU HAVE THE .NET FRAMEWORK 4.5 INSTALLED ON YOUR MACHINE! MAJOR: Added better compression for card images. Should be WAY smaller now. I recommend remaking your deck images. Thundross is a powerful deck creator for Tabletop Simulator. 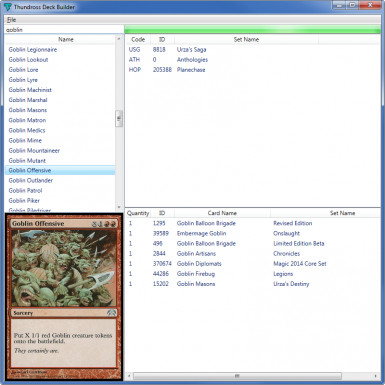 Currently it specializes in creating decks for Magic the Gathering, though more games may become available in the future. The program contains a database of all cards and all of their sets. You can search for each card and add any set version of the card to your deck. 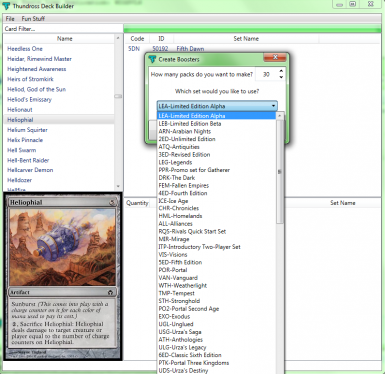 Automatically Updating Magic the Gathering Card Database. Grabs card images off the internet, no need to get them yourself! Easy to use Deck Building. Search for the card you want in your deck on the left pane. Select the set version of the card you'd like and double click it. If you'd like more than one of the card, double click it again. Repeat until you've created your deck. Select the folder you'd like your deck sheets exported to. Deck sheets will be generated as 1.jpg, 2.jpg, 3.jpg, etc... until all cards have been generated. Upload the sheets somewhere, import them into your game and enjoy! Stop being an alpha release. Set a card as a commander card. Put it on a separate sheet. Remove cards from a deck. Change card quantity in deck. Maybe other card game types? This program has no affiliation whatsoever with Wizards of the Coast. I claim no ownership over any and all images downloaded by this program.